A child of the American frontier, Mattie Sleeth was a fire and brimstone Methodist preacher who honed her skills on the prairies of Kansas and Nebraska before moving to Portland where she rose to statewide prominence as a suffragist and temperance advocate. She served as the first woman juror on an Oregon State court in 1922, after having worked for the passage by the Oregon Legislature of the Woman’s Jury Law of 1921. She served as the president of the Women’s Christian Temperance Union in Oregon from 1918 to 1920, which included the period when Congress passed the Volstead Act in 1919. 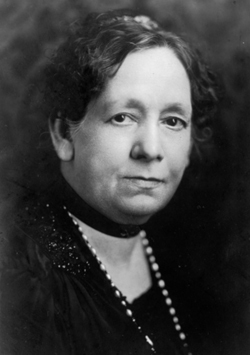 She ran unsuccessfully for the state legislature in 1916, all the while traveling by stagecoach, train, and car advocating statewide for women’s rights and temperance. Mattie Sleeth was part of a transitional generation of American feminists. Guided by Methodism’s commitment to temperance instilled in her through the preaching of frontier evangelicals, her fundamental commitment was to the moral purity of the individual in society. She lectured widely on women’s suffrage, fought city corruption in Portland, and lobbied for reform legislation. For her, morality and reform were synonymous. Born on a farm in 1852 in Ohio, Mattie’s family came west circa the late 1850s during the days of “bleeding Kansas” as the state struggled over the issue of slavery. When the Civil War came, her father and four of five brothers enlisted in the Union Army. Mattie and the rest of the family survived the 1863 Lawrence Massacre by Confederate raider William Quantrill at Lawrence, Kansas during which nearly 200 people died. After serving for most of the late 19th Century as frontier ministers, Mattie and Asa followed their only child Dana Sleeth to Portland, circa 1903. While close to her son, Mattie would assuredly have looked down on his drinking and carousing with the likes of the writer Stewart Holbrook, socialist Tom Burns and other journalists and politicians as Dana worked on Scripps papers from Seattle to Portland to Los Angeles. Mother and son maintained homes next door to one another on Michigan Avenue in North Portland to the end of Mattie’s life. Mattie attended the University of Kansas, at least through her sophomore year, while her husband was an 1869 graduate of Indiana Asbury College. Both Mattie and her husband were voracious readers. Late in life, Mattie added Hebrew to her command of both Latin and Greek. An intellectual, Progressive activist, a minister, and wife, she made her biggest mark on the public issues of her day in Oregon, where she died in 1934. Mattie Sleeth’s papers are combined with those of her son Dana Sleeth, a progressive-era journalist employed by E.W. Scripps, and those of Asa Sleeth, Mattie’s husband, who was also a Methodist minister in North Portland, as well as an attorney, theologian and inventor. The collection includes photographs, ephemera and diaries from her travels, expense accounts, family letters and various poems and papers documenting her time in the Oregon WCTU and related activities both in the Democratic Party and in the Methodist Church. Also included are two papers from 1979 and 1981 on Mattie Sleeth by Janet Asteroff, then a student at Columbia University.